Having discovered the files etc on Philofaxy, I have been busy printing and punching holes. Now ready for the rest of 2012 and the start of 2013. Today I received a filofax Osterley that I found online at a bargain price. 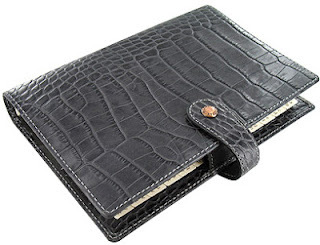 It is a very nice filofax and very made differently from some of the less expensive alternatives. I took it out of the box, opened it up and then put it back for safe keeping. Not sure that my work enviroment will justify such an luxury item, so I think that I will be listing it on ebay soon. Such a gorgeous filo, I *need* this one! I've put it in watching...I like it but would love for a plum one to become available!